Klingers are Kremlings with the capability of climbing ropes and chains. Their main appearances are in Donkey Kong Country 2: Diddy's Kong Quest and Donkey Kong Land 2. 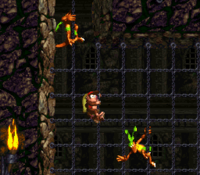 Two Klingers in Chain Link Chamber of Donkey Kong Country 2. Because Kremlings were not born with an instinctive climbing ability, Klingers were specifically trained to achieve this ability. Klingers are orange-skinned, yellow-bellied Kremlings with a long, scaly tail. They wear a green, white-spotted head bandana and a matching loincloth around the waist. Klingers (aside from Klobbers) are among the few Kremlings to have ears, in which they have a hoop earring for each one. Klingers have clawed toes but their fingers do not. They also have a large dagger in their mouth, but are not known to use it. 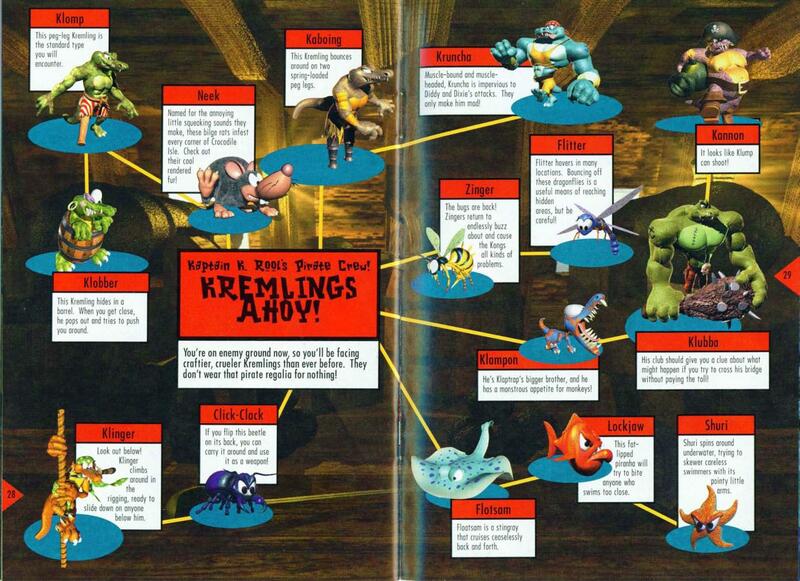 Klingers are classified with the other Kremlings under "Kremling Kuthroats" during the Donkey Kong Country 2 end credits, or "The Baddies" for Donkey Kong Land 2's. 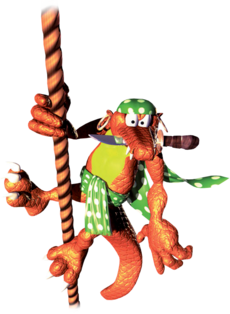 Klingers have a similar role in both Donkey Kong Country 2 and Donkey Kong Land 2, and first appear in Mainbrace Mayhem of each game. Klingers repeatedly climb up a rope or chain then slide down. They usually make it harder for Diddy and Dixie to go across the ropes, which is mostly noticeable in Chain Link Chamber where Klingers are featured as the main enemy. In Krockhead Klamber, the Klingers are climbing on swamp reeds. Like with other enemies, the player loses the lead Kong if they hit a Klinger. Diddy and Dixie can defeat Klingers by throwing objects at them, including barrels, kannonballs, or crates. This causes the affected Klingers to fall off the rope. Klinger makes a cameo in the Freestyle Zone of Donkey Konga 2 along with some other characters. Klinger's artwork sometimes displays on screen in correspondence to the player hitting the DK Bongos. Artwork used on the instruction booklet. In Donkey Konga 2's Freestyle Zone. ↑ Donkey Kong Country 2: Diddy's Kong Quest instruction booklet, page 28. This page was last edited on March 16, 2019, at 21:47.